....I turned to east and saw a bright light in eastern sky proceeding from south to north. The light was a bright white ball with a lighter white light in the shape of a boomerang at the nose of the ball. The light proceeded at a good rate of speed, slowed down for a short period, then regained speed again. There are large trees in town so I lost sight of it after about 30 seconds. I went north down the street to see if I could continue to see the light but it was gone...The ball of light did not make a sound. The shape would be if you took a boomerang, turned it so that it was pointing north and the ball of light was behind the pointy part. The ball was bright and the boomerang part was lit but not as bright as the ball. I’ve seen shooting stars before and this was not that. I don’t know what it was but it definitely affected me. point), I noticed a light moving from West to East. It was bluish to green in color. The strange thing was that it had 3 plumes coming out of it. One plume was directly behind it and two others were coming almost straight out the sides. It was very bright and easily noticeable. Following behind the first were three more. They were single lights, almost as bright, but smaller and yellow colored. There were no plumes on these lights. All 4 lights were following a same flight pattern, but far enough apart that there is no way it could have been a single aircraft. The first (plumed), third and fourth lights were in a direct line. The second light was higher in altitude. Ted Molczan computed the pass of the second stage for this time period and produced a ground track that explained the sightings rather well. Apparently, the second stage booster was venting spent fuel and the sun illuminated the expanding cloud of gas/fuel. These observers did see a unique event. However, they did not see anything alien. The third set of reports were made when the second stage rocket re-entered the earth’s atmosphere over eastern Russia on January 18th around 6:48 local time. There was a spectacular video of the re-entry. I am unaware of any UFO reports being filed for the event but I only examined MUFON’s and NUFORC’s database. I find it interesting how witnesses like to associate military and other official vehicles with UFO reports. These police vehicles were probably responding to something else. I doubt they were trying to chase a rocket launch. NUFORC and MUFON did not have any UFO reports. Does this mean that California observers are more critical and aware of the rocket launches? It appears that weather was a factor in preventing UFO reports as many nearby locations were cloudy. Videos of the launch showed the rocket enter into a cloud back shortly after launch indicating it was not widely observed. February 11 Falcon 9 launch from Cape Canaveral at 6:03PM. The time of the report and direction of flight indicate he was observing the second stage burn, which was over five minutes long and quite spectacular for those wanting to observe it. Another report came from Portsmouth, Virginia. 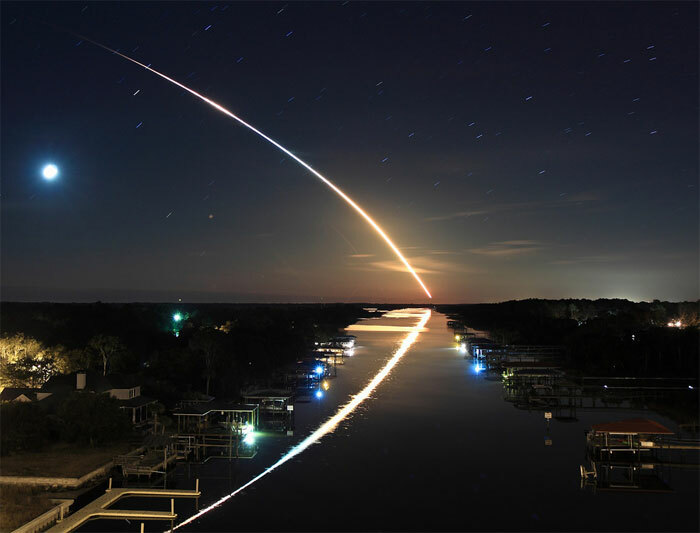 It was very brief and described the object as a bright light with a tail and appearing like a comet.11 This event was a good example of how rocket launches, under the right conditions, can be seen from great distances. A brilliant re-entry display occurred over the western United States and Canada on the night of February 23rd. The trajectory was a south to north track that happened between 05:52 and 05:58 UTC (10:52-10:58 MST/9:52-9:58 PST). This event produced many reports to the American Meteor Society and quite a few to MUFON. MUFON’s reports were interesting in how witnesses reported the event. As expected there were a few that perceived the re-entry as a craft with lights instead of individual fragments. These are all examples of the “airship” and “excitedness” effects noted by Dr. William Hartmann in regards to the Zond IV event. The witnesses did see something but they were very wrong in the conclusions they drew. The DID NOT know what they saw. On the morning of February 25th, White Sands launched a missile that released a scientific payload into the upper atmosphere. The resultant release of vapor created an interesting pink display in the morning sky. It was visible from Chihuahua, Mexico, where a report describing the display was filed with MUFON. I wonder if MUFON will identify this one? strange to those not familiar with them. UFO databases need to take note of these kinds of reports and label them as IFOs.